Pharmaceutical giant AbbVie illegally plied doctors with cash, gifts and services to prescribe one of the world's best-selling drugs, Humira, despite its potentially deadly complications, a California official said in a lawsuit filed Tuesday. The lawsuit by the state's insurance commissioner accuses the company of a far-reaching kickback scheme that led doctors to write more prescriptions for the drug, tainting their relationship with patients and driving up insurance costs. It's likely patients were prescribed Humira because of the kickbacks provided by AbbVie and not because it was the best medication to treat them, California Insurance Commissioner Dave Jones said on a conference call announcing the lawsuit. "Ultimately, AbbVie gambled with the health and safety of thousands of Californians' lives, including children, by making sure patients continued to take Humira at any cost, all to protect their profits not the health and well-being of patients," Jones said. Jones said insurance companies paid more than $1.2 billion for Humira for thousands of California patients between 2013 and August 2018. That figure makes the lawsuit the largest health care fraud case in the state insurance department's history, according to Jones' office. AbbVie, which is facing billions of dollars in penalties, said the allegations are "without merit." "AbbVie operates in compliance with the many state and federal laws that govern interactions with health care providers and patients," the company's statement said. AbbVie paid for doctors' meals, drinks and travel to get them to write more prescriptions for Humira, according to the lawsuit. The kickback scheme also included nurses whom the company sent to the homes of patients taking the drug, the lawsuit says. The nurses saved doctors money by handling paperwork and other tasks that normally fall to physicians' offices. They were presented as extensions of the doctors' offices, but in fact blocked patients from communicating their concerns about Humira to physicians and downplayed the drug's risks, according to Jones and the lawsuit. 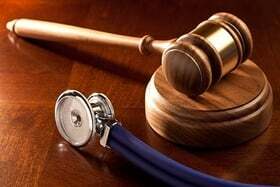 "If given the choice between two medications, one which comes with free nurses and administrative staff and another that requires the provider to pay professional salaries, the provider cannot but help factor the substantial nursing kickback into their prescribing calculus," the lawsuit says. AbbVie said nursing help and other support services that it provides educate and assist patients with their therapy and "in no way replace or interfere with interactions between patients and their health care providers." The state's lawsuit is based on allegations by a registered nurse who worked for AbbVie. The nurse is also a party to the suit.